I popped into town the other day to take some stuff back to Topshop that I had decided I didn't like/need and I accidentally came out with two coats! I just thought I'd have a little look at the new things that had been added to the sale and found these two, both of which I had loved when they first came in and both in my size! I must have tried them both on about 10 times, but couldn't decide which one I preferred so now I'm asking you, which one do I keep? Oh and don't say both! While I was taking these shots I was experimenting with using the flash because the light in my room is awful and my photos always look so grainy even though I use a decent camera. I covered the flash with sheets of tissue to diffuse the light so the photos didn't look so harsh but I seem to have fucked up my camera in the process. There's now a large tea stain sort of blob on the screen, but it doesn't show up on the actual photo, does anyone have any idea what I've done and if there's any way I can fix it? it can be dressed smart and casual and is generally very cute! and sorry to hear about your camera, I wish I knew anything about them! I've wanted the one on the right for aaages! Is is in the sale? Love it. Definitely the one on the right. Second one! I don't mean to make any offence my sweet but the first makes you look a little...um...wide. second one gets my vote - beautiful colour and looks great on you! Love the first one. It's so cute! I love the second one, it looks much more versatile! About your camera- sounds like the screen has been damaged. One of my cameras has a faint dark little blob and it was thanks to the weight of something heavy on it. The blob is the liquid crystal leaking out. I think the only way to fix it would be a new screen. Both? I personally prefer the colour of the first one and the fur collar gives it a little extra something. the second one! the colour is so nice and it doesnt look like a winter coat.. springs just round the corner :) the first one, although lovely, looks like it might be to warm with the collar and everything and you want a coat you can throw on all the rest of this year! they're both really nice but i prefer the second one as you dress it up or down as you like since it doesnt look like a typical winter coat. I prefer the first one, I actually tried the second one on in store and although I liked it, I didn't like the short sleeves. The one on the left is my favourite, it's perfection! The first one almost made its way into my own basket and in this case I think it's probably the nicer of the two, only slightly though. I love the colour of the second one but its the sleeves not being long enough that puts me off. Hope you get the camera sorted, camera woes are the worst! Love your style!!! Both are great!! I prefer the red on the left! And I have never heard of that tissue paper over the lense trick. Let me know if you solve it! Oh, and welcome back, by the way! I think you should keep the first coat- I like the silhouette, and I especially love the color. I've been dying for a pretty red coat (and I would especially love if it a hood with fur along the rim...) So chic these days! For me it's the second one. I really like the cut and the color, it looks more like a blazer. Whatever you decide though, they are both gorgeous coats. I like the first! It's a nicer cut and it looks like it'd be warmer! Definitely the second one: my mate has it too and it looks GREAT irl! Oh my dear, you have such divine style! Thanks so much for commenting on my blog because I am so inspired by your outfits! 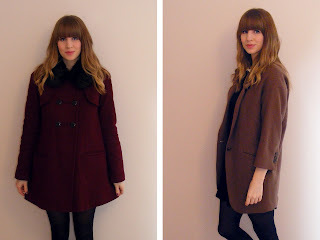 I love both of those coats, you are right, it is too hard to decide! I love them both! But I have to say the first one because of the cut and color. I think the second one is a lot more special, and looks great on you. Oh wow, they are both amazing - but I personally prefer the first one. They both look great on you and the second is a bit more cool masculine style, but I love the colour and cut of the first! Good luck choosing!! Yes, I vote number one too! I love coats with fur collars. thanks for your comment and stop to visit my blog Lizzie, your own is great and I love your style of fashion and mood ! you are so cute and adorable. oh my goodness, keep the one on the right. i love it. LOVE IT. I'm loving the second one. It has that sort of men's blazer feel, but still feminine. the red one with the collar is adorable! I really love that 2nd coat! The camel shade and the style of it looks great on you! Love the blog too, I will definitely be back! The one on the left please! Love the colour and the collar details! I like the one on the right. Both are lovely, but I feel like the second one is more versatile due to the color and the shape. I am useless because I adore both. However, if FORCED to choose, I'd say the second. simply because the traditional pea coat will always be around should you need to splurge in the future. the second was made for you! argh. i got the second one for christmas, and i love it but i never know what to wear it with so it'd been out of the house once since then. Everyone seems to be saying the second but I vote for the first, I loove it! Your blog is just scrumptious!! I'm checking back all the time from now on! Please check out my blog, and follow if you like it, I'll be sure to do the same back! the one on the right! definitely! sorry, i wish i knew what was wrong with your camera! Although the both look lovely, the second is the keeper to me. Simple but a little unusual, gorgeous and versatile colour and great shape. I'd say the first one! But they're both very pretty! I'd say the red one, though thats because I've seen it in Topshop and wanted it for myself because its lovely, ha! i love them both but i think the first one, because you've got a blazer already, and such a big coat difference will add a huge impact on your outfits. love your recent outfit post too lizzie, but i didn't want to spam your blogs with comments so i'll just say it in this one. The red one! Glad to see your back in business.